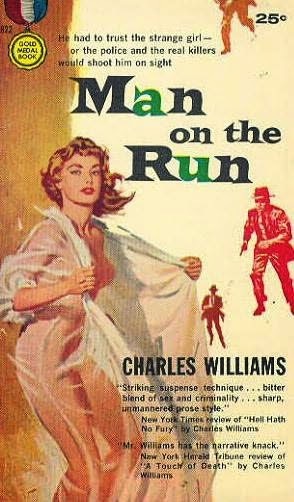 Man on the Run (1958) is the weakest of the nine novels I've read recently by that excellent writer of paperback originals, Charles Williams, but those weaknesses stimulated some thought about what we mean by weak writing, what makes some books worse than others, and possible explanations for why those books fall short. First of all, Man on the Run is a pretty good book; it just suffers by comparison with Williams' Nothing in Her Way (1953), A Touch of Death (1954), or his classic comedy Uncle Sagamore and His Girls (1959). I'd give those books five stars each, and maybe three to Man on the Run, with The Hot Spot (1953), Aground, (1961), The Concrete Flamingo (1958), The Big Bite (1956), and The Diamond Bikini (1956) somewhere in between. So, what makes Man on the Run weaker than the rest? For one thing, an occasional tendency to talkiness. For another, repetition of mildly odd phrases, including "intensely silent" and "sobbing for breath." That this repetition occurs with greater frequency toward the end of the book suggests to me that Williams may not have had his heart in it. I noticed this especially because Williams' work (and also Peter Rabe's) had previously stood out for me precisely because it avoided such repetition. That's part of why I considered Williams a more polished writer, if not necessarily a better one, than Harry Whittington, Gil Brewer, and Day Keene. The plot of Man on the Run also stands out. Williams was at his best writing about duped, infatuated, deluded men, but this book, as one might guess from its title, is instead about a fugitive. It was also published in 1958, and that's where things get interesting: 1958 was also the year of 77 Sunset Strip, a republication of three novellas by Roy Huggins, one of which I would bet the take of my next heist was the germ of the idea that Huggins later turned into The Fugitive. Men on the run were in the air in 1958. My tentative conclusion: Whether urged by a publisher or agent, or whether on his own initiative, Williams wrote Man on the Run to satisfy a perceived market demand for fugitive stories and, in so doing, painted himself into a corner where he was less accomplished and less comfortable (hence the repetition). To be sure, the suspense is well written, and Man on the Run contains elements of Williams' more customary infatuated-man tales. It also has one of the odder endings in noir fiction and, if that end seems a bit contrived, Williams had laid careful groundwork for it throughout the book. Even here, he remained an admirable plotter. Peter, I'm adding Charles Williams to my "must read" list at Crimes in the Library, and I appreciate the candor of your review (i.e., now I know which Williams novel might not be the best place for my introduction to his work). Give me you recommendation about the best Williams novel. Then I can begin the shopping! The best I've read is Nothing in Her Way, and that seems to be something of a consensus among people who write about Williams. I'd start with that and then perhaps A Touch of Death. Uncle Sagamore and His Girls and The Diamond Bikini are more rural comedy than crime, and both are good, the former especially. I would suggest online searches for what people like Bill Crider, Cullen Gallagher, and the Stark House Press folks say about WIlliams.